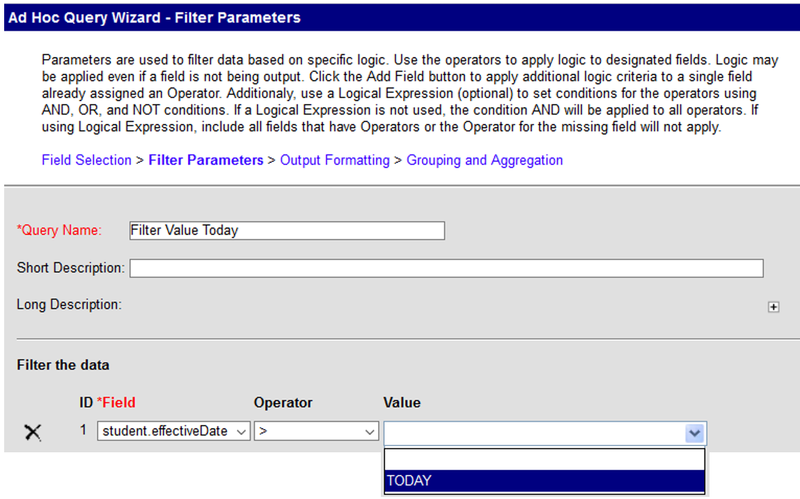 A new value has been added to the filter selection within the Query Wizard for date fields called “Today”. This option provides more flexibility in filtering since it may be utilized in conjunction with other operators such as > and <. More updates and enhancements have been made to various areas in Campus Student & Campus Parent which will eventually replace the portal. Refer to the Campus Community 1913 Release Notes to review a comprehensive list of items included in this release. 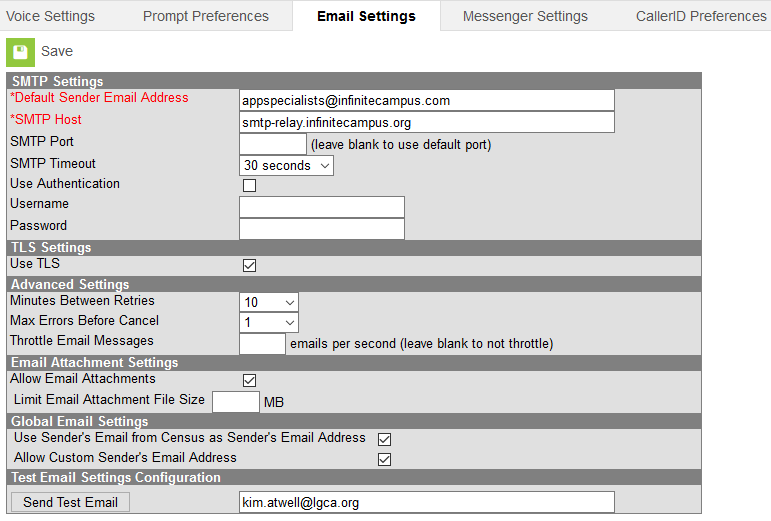 A Send Test Email field has been added to the Email Settings tab. 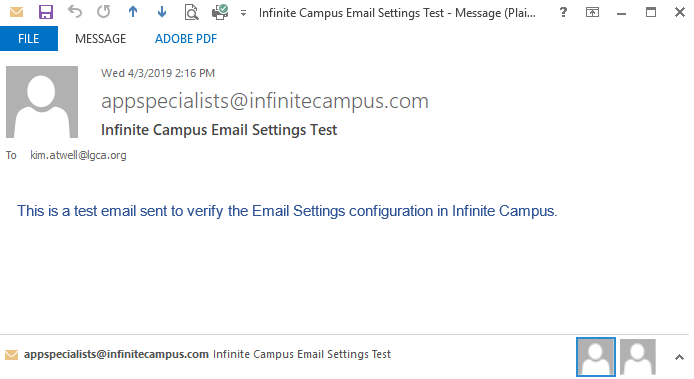 This new field allows you to enter an email address and send a test email to verify the email messenger settings are functioning and accurate. If the settings are correct, you will receive a test email in your inbox. Several report card printing issues have been corrected. Refer to the Campus Community 1913 Release Notes to review a comprehensive list of items corrected in this release. The Enrollment Summary Details report now allows the user to choose state or local end status types for report inclusion. The Enrollment Status Report and the No Show Report are now able to generate output in either a csv or docx format. Two blank options have been added to the School Age Planning Form editor for the Other Assessment Area grouping. An issue with the ETR 2018 and 2018.2 Page Break functionality has been fixed. When utilizing the District Information Editor “Get Information” button, users will now be able to successfully save the information. A validation has been added upon locking the Plan to ensure required fields on the Enrollment Status editors have been populated. A Goal/Standard validation has been added to recognize the number “1” and “01” as one and the same. The validation will prohibit users from using a zero and the same number twice. The report has been updated to look at the Statewide & Districtwide Testing editor. Date Range fields have been added to the extract editors of the CN and GN extracts, which limit records reported to those that fall on or within the dates entered. 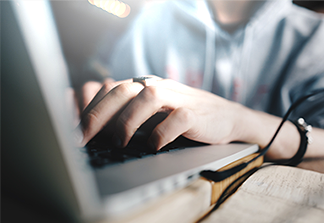 The Military Student Identifier field in the FN extract has been updated to report a value of C if the student's relationship is to a member of the Reserves. The Majority of Attendance calculation has been updated to consider the enrollment.admoverride value instead of the enrollment.percentEnrolled value.